Built upon the Nodechain®, your wealth is more secure because your transaction data is not public. What is the “Atomic Central Bank”? The words “Atomic” and “Central” are opposites. The Atomic Central Bank is a distributed central bank that exists in software only, and, using the best available monetary practices, automates the functioning of the FreeMark central bank, so that it works for its users, savers and importantly makes the FreeMark the world’s best digital currency, stable, yet liquid and tied to assets so that it has a genuine value at its foundation, making it more valuable than fiat currencies. How can you make even a ~10% annual return consistently when you are trading in and out of a volatile fiat currency, or in the future with a cryptocurrency? Returns on ownership of 20Xs or more are possible with FreeMark for early buyers, upon the expansion of the money supply. (Note: all potential rewards of any nature have a corresponding risk for which the reward is provided.) The reward for the FreeMark is mathematically engineered as compensation correlated to the growth of the money supply. As an investor, you need a stable currency to trade from. As a manufacturer, you need a stable currency to trade with. As a business person, you need a stable currency to buy and sell with. As an individual, you need a stable currency to maintain and protect your family wealth's purchasing power. Other cryptocurrencies call themselves stable. But how are they stable if they peg to the volatile USD? The USD can vary between 1-5% per week—it's one of the most stable fiat currencies! We have all been lulled into accepting this excessive volatility as normal. But volatility means greater risk and complexity for manufacturers, traders and those who do any kind of international business. Worldfree’s Team has re-engineered the cryptocurrency, including the blockchain itself. Led by a second-generation software entrepreneur, veteran fintech and AI software developer, the CEO and his team have re-designed the digital currency functionally—both economically and technologically, from the ground up. The Worldfree team developed the world’s first technology to deliver direct answers from live, unstructured internet text. The technology has been used by many G200 clients and IBM offered to acquire it. 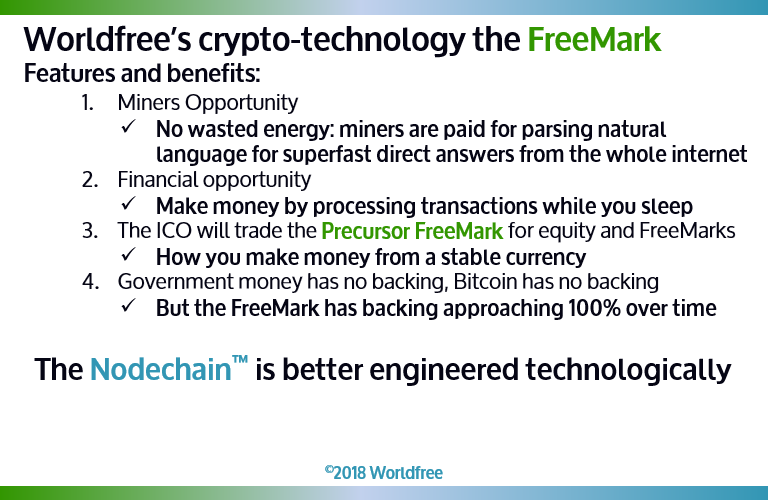 Now Worldfree is bringing natural language reasoning to a better engineered cryptocurrency, along with advanced crypto- and economic technology. A 3-time entrepreneur, founding companies using technologies including artificial intelligence, robotics and engineering. Built one AI company that a G200 firm offered to acquire. Began career many years ago working for his family's software firm, the Kirchman Corporation, at one time the US's largest banking software firm. 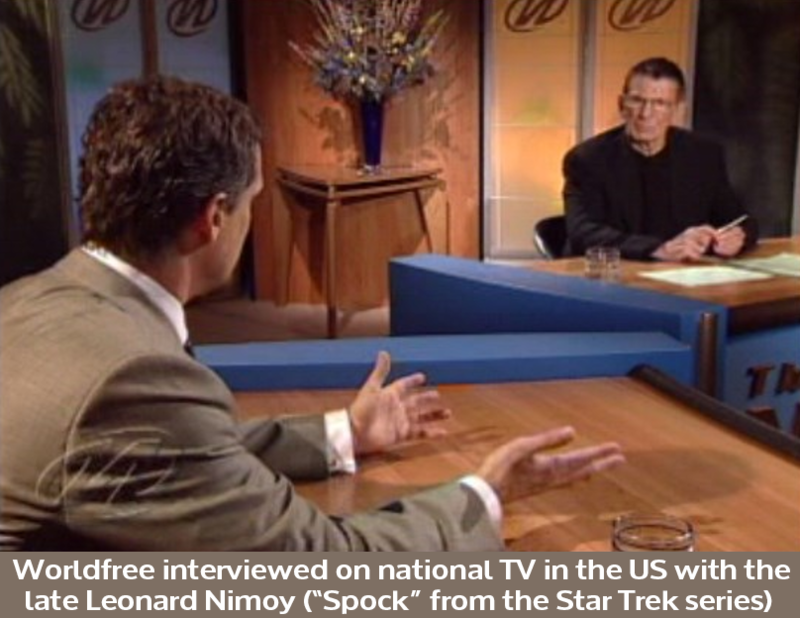 He has written one book on innovation, with degrees in mechanical and aerospace engineering (Cornell U) and computer science. Dr Theo Mourouzis is a Research Fellow at the UCL Centre for Blockchain Technologies (UCL CBT) and Programme Director of the MSc in Business Intelligence and Data Analytics at the Cyprus International Institute of Management (CIIM). Theo received his PhD in Computer Science (with specialisation in symmetric cryptanalysis) from University College London (Information Security Group), with a BA/MA in Mathematics from University of Cambridge. An expert in IT project and product management and network security with a speciality in blockchain technologies. An information privacy professional and a knowledge engineer for semantic technologies and intelligent software systems. An expert angel investor and serial entrepreneur with a passion for turning unique technology into successful business. A highly experienced company chair and director of both public and private companies, having taken IP-based companies to IPOs and other exits both in Australia and internationally. The Chief editor Irish Tech News and Cryptocoin.News, #1 ranked ICO advisor on ICObench for last 3 months. Winner of Irish Web Awards 2014, best Science & Technology category, and Winner 2016 Littlewoods Best Ireland Blog for Digital & Tech. A Worldfree investor and successful venture investor, with many years of experience as a product developer. 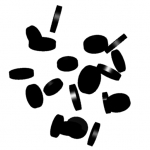 Focus on strategic thinking and developing strong value propositions. A Bitcoin trader, miner and broker, with many years as an IT professional. Thorough knowledge of the cryptocurrency market, its history and basis for its growth. A Senior Lecturer at the Faculty of Law, the University of Technology Sydney (UTS), Australia. Specialized in intellectual property (IP) commercialisation, anti-trust law, privacy law, transfer pricing, digital law and policy. Why is the FreeMark Stable? How is it Backed by Assets? The FreeMark is not a fiat currency. Government or Cryptofiat currencies like Bitcoin have no intrinsic value. It and other stable coins have taken the worst aspect of government currencies and copied it in the digital world. There are no physical or productive assets backing them, unlike the FreeMark, where 65% of revenues (90% later) from sales go into an audited, regulated fund. The Business White Paper answers the questions: What are the terms of FreeMark? How does the FreeMark work? The Business White Paper also examines the basis of valuing a currency, and how that relates to valuing other financial assets. The White Paper explains the different paradigm the FreeMark is built upon. Instead of the consensus paradigm, the basis of modern oligarchy (misnamed "democracy"), the paper shows how in Ancient Athens the original democracy was built upon sortition, or random, blind selection, rather than voting for leaders, which facilitates corruption. The FreeMark technology is built upon sortition, and is therefore more egalitarian, as well as being more scalable and efficient. The FreeMark is aiming for the bigger opportunity: the market for the next phase of cryptocurrency adoption is ~30% of the global GDP, or about $40 trillion in payments. Many ICO’s tout their justification for use in financial transactions, thus expanding cryptocurrency use. But volatile digicurrencies, using the prevailing model of varying market price, behave in exactly the opposite way of the best medium of exchange. The best kind of currency for everyday financial transactions is stable: more stable than fiat currencies, and certainly more stable than most cryptocurrencies. But that is not enough. The larger market needs an incentive to switch to a cryptocurrency. It must be stable, but it also must produce a return. The FreeMark does this by paying a royalty based upon the growth rate of the money supply, completely reversing the inflationary erosion of savings by making natural market growth an ally, and incentivising viral growth. FreeMark owners will in addition buy and sell globally without exchange rate risk, with both inflation and deflation resistance. 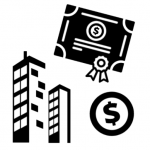 FreeMarks are also legally tied to real assets, held in a regulated, audited fund, unlike other fiat money offered by governments or mainstream cryptocurrencies. How can you trade volatile assets with a volatile cryptocurrency? The volatilities multiply, making rational investing impractical at best. That will never catch on, and hasn’t yet. Furthermore, for traders in goods and services, such as manufacturers, importers and exporters, exchange rate risks and hedging practices are a real problem. A stable cryptocurrency, based upon a peer-to-peer, distributed platform solves that problem, and provides incentive for the switch. Governments removed asset-backing in the early 1970’s, floating currencies globally so they could print as much as they wanted. By creating money from nothing, they devalue the wealth their populations have earned through hard work and innovation. Already taxed horrendously, most developed governments have put their countries deep into debt. Now new generations are stuck with obligations they cannot expect to meet: they are slowly becoming slaves to incompetent bureaucrats who create little value for their people in exchange for the money they confiscate. Faced with this nightmare, people invented the Bitcoin and other cryptocurrencies, and once again gave themselves some hope for better lives. What is this solution? They are printing money for nothing, just like their governments! They are also “taxing” people to provide currency, and taking a little of that from the governments. At least people are making money while they do it, however. But the invention of digital money is a much better opportunity than these innovators realised. 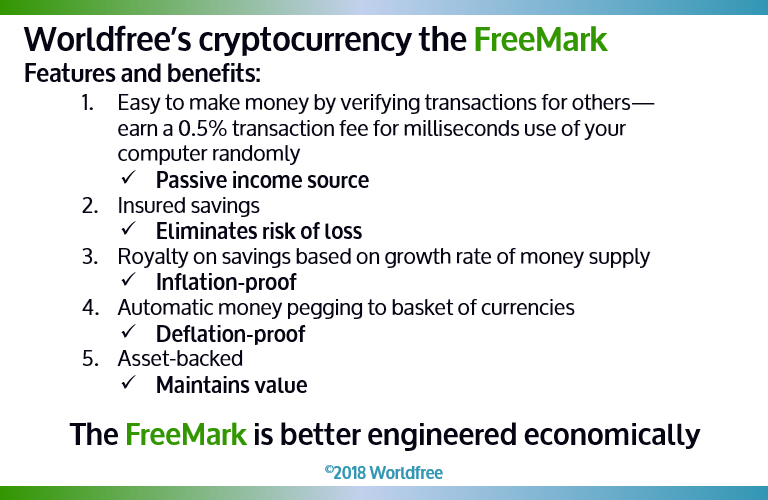 Instead of more fiat, in the form of Cryptofiat, Worldfree’s asset-backed, stable currency, the FreeMark, restores legitimacy to monetary policy, and automatically pays royalties to savers when the money supply expands, the opposite of inflation. 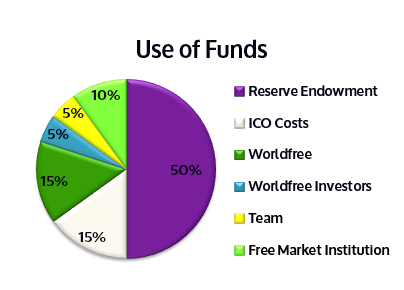 Because most of the money the currency is sold for is saved in order to back the currency in a managed, audited and regulated fund invested in physical and productive assets, the FreeMark is a better medium of exchange than government or crypto fiat, providing an opportunity for inflation and deflation resistant financial culture. The Worldfree Network is a pro-business network, built by producers and value creators for value creators, in order to defend the greater freedom Hayek explained so eloquently. Well, this is not actually so—it is an invalid assumption. We can confirm a transaction has not occurred and changed the ownership of a coin if there is only one instance of a coin, as there is in every-day cash transactions. Do you ask who owned money before accepting it as change in a transaction? Does anyone ask you? Of course not—this is an example thousands of years old of another type of transaction—so why can’t that be replicated with the nearly infinite control we have of the digital world? 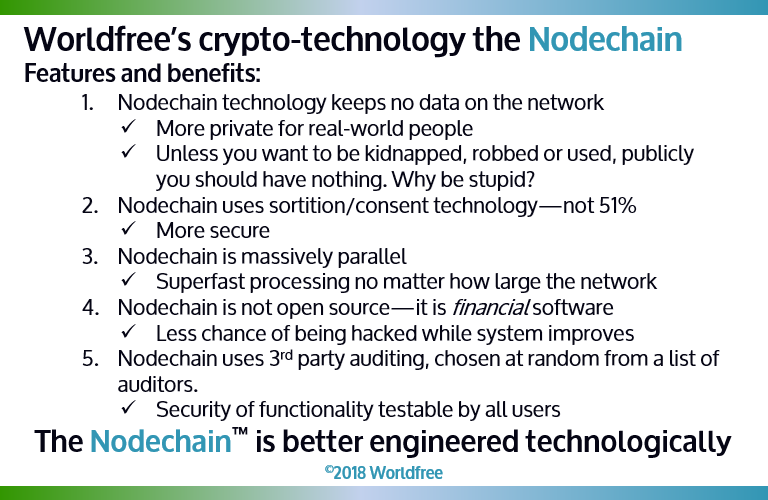 Worldfree has done exactly that with its innovative, completely scalable Nodechain technology. The Nodechain is just as fast processing 1 million or 1 billion nodes, because every node shares in the processing load, and shares in the financial benefits. The FreeMark is a stable: pegged to a basket of 20 commodities, including oil, wheat, copper, aluminium, cotton and others. 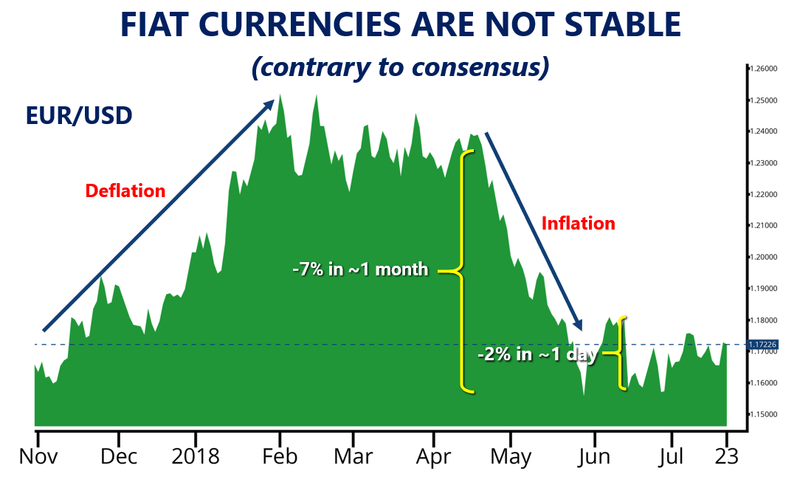 Using a 6-month moving average of a weighted combination of these commodities, it truly reflects changes due to inflation of government currencies. The Atomic Central Bank® is a distributed control paradigm that automatically implements the rules of the system, called Digital Prerogative. The ACB pays Growth Rate Royalties automatically. Worldfree restarted with advanced natural language reasoning having already been used commercially by many G200 clients. Tech due diligence on Blockchain begins.